Dustin F. Von Ruden is a member of the firm’s business transactions group, representing businesses, municipalities and individuals in a wide range of real estate development, business transaction, financing, contract and general corporate matters. He devotes an extensive amount of his practice to all phases of commercial real estate development and transactions, including sales and acquisitions, leasing, financing, construction, zoning and land use, and entity formation matters. His extensive real estate practice includes complex developments and transactions related to retail shopping centers, office and industrial parks, frac sand mines, multi-family residential, healthcare, telecommunications, energy and municipal facilities. In addition to his real estate practice, Dustin provides advice and representation on a wide variety of business, finance and contract matters to banking and financial institutions, telecommunications companies, municipalities, educational institutions, agricultural businesses and individuals. 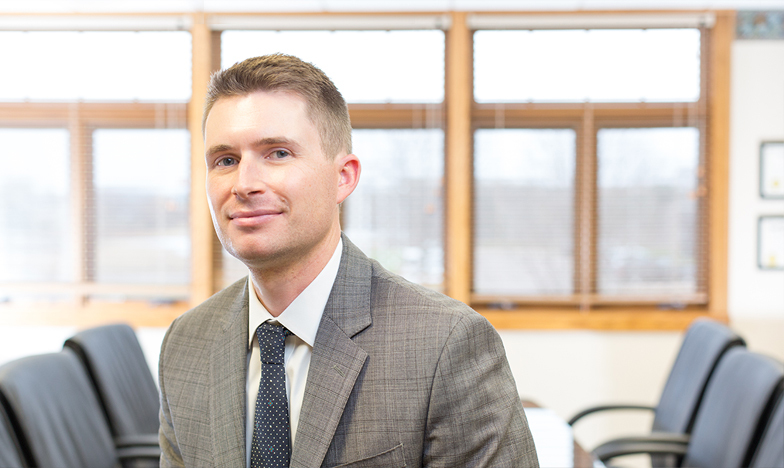 Dustin is a member of the American Bar Association, the Wisconsin Bar Association, the Minnesota Bar Association, the Eau Claire County Bar Association, and a Young Professional of the Chippewa Valley. In his free time, Dustin enjoys spending time with his family, fishing local lakes, rivers and streams, and hunting at his family’s farm near Cashton.